My parents drove me back from John O’Groats along the A9 to Inverness and having gone the other way to the top, I’d sincerely recommend going the quiet route. Infinitely flatter and quieter. Though you WILL lose phone signal so be prepared for that. Once you’re past Lairg you’ll only go past the Crask Inn (the most remote hotel in the UK apparently) and Altnaharra which is where I stayed. You’ll read about these two places quite a bit from people who have done the trip and gone this route because there’s not much between here and Tongue/Bettyhill so there aren’t too many choices of places to stay. 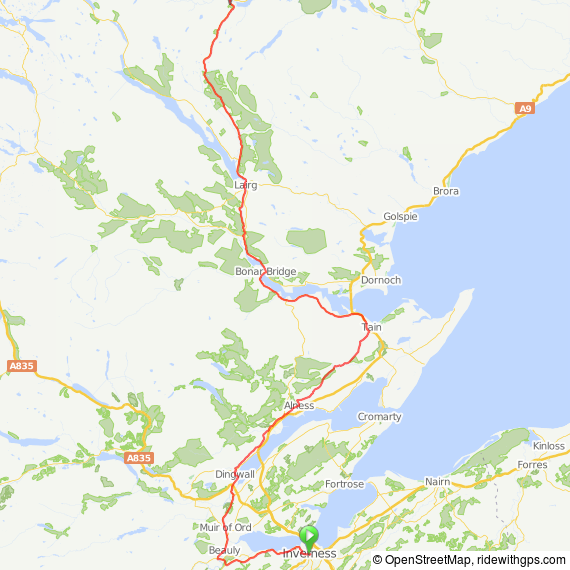 I met people who had booked somewhere to stay at Lairg but pushed on further to the Crask Inn, got picked up by their support and dropped back there the next day just because it feels like the right distance to be doing each day. So if you’re planning your own trip, decided which one you want to stay at early and book it well in advance. I stayed at Altnaharra in the LEJOG cabin (much cheaper and very warm and comfortable). The lack of phone signal is quite relaxing too – enjoy!